I've finally finished my plushie of Fluttershy from My Little Pony Friendship is Magic! Fluttershy is made from minky with appliqued satin eyes. Her lashes are made from a flat suede cording which allows them to stick out like real lashes. Fluttershy was a commission and is not for sale. I want to hug it so bad, it's so cute! Amazing work and so cool. Flutter shy is only second to Scootaloo, but that is only because my nickname is ScootaLeutz, lol. aka John Leutz I shared this on my Little pony Savage World Facebook Page. Keep up the amazing work. Very well done plushie! I love it! I don't really have an emotion cause im just in shock. 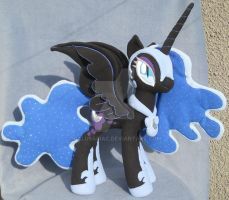 This is the only plush that actually looks like her. Are you still making Fluttershy plushies? I'm not making any plushies for sale at the moment, so if I make a Fluttershy it will either be for myself or as a trade with someone. Wow! She's beautiful! Excellent job! Do you know where I can get some of that cording? Those lashes look amazing! I bought it at Micheal's but the past two times I've been there they haven't had the really thin stuff. I'm trying to find an online source for it and have a few things that look promising, but I haven't bought it yet so I'm not 100% sure it's the right stuff. Thank you very much! I'll look for it next time I go to Micheal's! Keep up the amazing work! I just use two layers of batting and then do the top stitching through all the layers to give it structure. To make it stick up you just tack it down in a couple places to the side of her head. i want a cuddly fluttershy!! She's so cute! I really like the way you did her wings. You make the best plushies! Good job!